Little girls aren’t the only ones who pick at scabs. We do it all the time. Maybe we don’t pick at the brown crusty scabs that form over a flesh wound preventing the skin underneath to heal. But many times we pick at the bitter rusty scabs that form over a soul-wound, not allowing the heart to heal. Click & Tweet! Barbara was raised in a “religious” home, the youngest of twelve children. He father drank heavily and made sport of belittling his children and his wife. Her insecure mom always seemed to be tiptoeing through life and did little to protect her kids from her menacing husband. When Barbara’s dad forced his daughters to parade in front of him in their underwear, her mom remained fearfully silent. I talked with Barbara for a long time as she recounted her story to me. I reassured her of God’s full forgiveness and undeserved grace. I pointed out redemptive Bible verses right there in black and white, and some in red. We talked about the necessity of forgiving those who have wronged us and forgiving ourselves for those we have wronged. We talked about letting go of the past and moving forward in the present. We talked about the truth that when we come to Christ, we become a new creation, the old is gone and the new has come. After about an hour, I realized that we weren’t getting anywhere. I don’t know about you, but more than anything I want to live free of bitterness, resentment, shame, and condemnation. So when God says to me, “Do you want to get well,” my answer is always yes. But that means I have to cooperate by forgiving those who’ve hurt me and forgiving myself Click & Tweet! 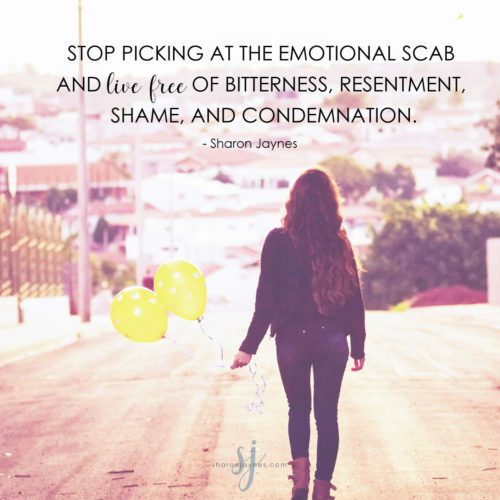 …to stop picking at the emotional scab and let it go. God, I’ll admit that I sometimes pick at emotional scabs. I replay what was done and how it was done. I don’t want to do that any longer. I want to get up off my emotional mat, get up, and walk in freedom. Today I forgive ________ for _________, and will no longer hold the offense against the offender. I also accept your forgiveness for my sin of __________, and will no longer live in shame and condemnation. In Jesus’ Name, Amen. What changes would we have to make in our lives to let go of past offenses and past shame? I’m thankful those words spoken my mother spoke so many negative words against me and my brothers. She would beat us but your remind me to let go all past hurts even now things said to me I most let it go. Your words made me know cannot keep looking at past hurts said and done to us. But look to what was done by Jesus Christ on the cross for us all. Has Barbara opened her heart to Jesus’ healing yet? I pray she is surrounded by children of God who can encourage her. There was abuse of my past ,when I was a child and not only by my father but by a teacher at school ,and for 60 years I tried to give it to God but the flashbacks of memories would come back. it wasn’t until I went to a therapist and I was able to get healing, I know God directed me to that therapist and he used her to help me past that pain in those memories . When is the pain is too great, sometimes God will lead us to other resources . Now I can press in closer to Him because I don’t have those traumas constantly haunting me . I am so thankful that God loves me so much, that He will bring me through all this but he did use therapist to help me . Don’t be afraid to reach out . I also sustained various types of abuse in my childhood, and I know how hard it is to work through. I’ve been to several different counselors and constantly work toward getting better. Like so many things in life, healing well requires *balance*. In order to entirely move through deep pain, it needs to be felt as fully as possible…*over a limited amount of time*, with the end result being less to no pain. Feeling it in order to move forward is *not the same* as getting in it and lying down…or picking at it. Abuse recovery also requires grieving…again, for a time. Acknowledging it happened, acknowledging the wrong, mourning the loss of what shouldn’t have been taken…and inviting God into it, to help in the process. Healing is not linear, and in my experience, it is not complete while we are in this world. Don’t misunderstand me: God ABSOLUTELY CAN fully heal, but most times, I’ve seen and experienced a *partial* healing. The pain is reasonably tolerable, but sometimes still tender…and it gives me another need to stay close to Him. The forgiveness piece is tough, but we can’t put ourselves in a position where we are unwilling to forgive ourselves or others, as that’s an attempt to supersede God. There are times when we need to ask Him to help us forgive…and if we keep seeking and are willing, it happens. Healing is a process, just like our faith. 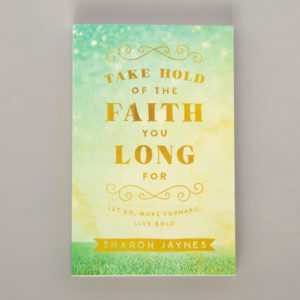 John 5:6 is one of my favorite verses, and the question posed is something we absolutely need to ask ourselves, in all ways, just as Sharon pointed out. I liked reading this. How can I share your writings on Twitter? This really hit HOME for me. I have been put down as long as I can remember, first it was my sisters poking fun at me for being the “baby” of the family, then my younger brothers learned it from them. It moved to others others around me who didn’t “get” my sense of humor, then men and boys for those “you ___ like a girl” statements. I never understood why being a girl was bad, but saw boys get away with stuff girls never could, the married men put wives down, comedians making “dumb women” jokes a standard. And my MALE Bosses who were patronizing about my serious concerns. So it’s not surprising I nurtured a very negative self image, striving to NOT be female. I worked hard and set high standards for myself only to have everything crash down on me after 40+ years when my Pastor went on a kick of telling “Women are stupid jokes” for weeks on end continuing for years even after I told him those jokes really bothered me. Now I’m still picking at those wounds, I really think I remember every single one of them and relive them over and over. Forgiving is one thing, forgetting is another. It takes only a word, an “off” comment, anything really to send me down those rabbit holes. Even as I age, those memories linger, I’ve begged for God’s help, I’ve tried “doing the work”, I’ve asked God what He wants me to do with this, but am still struggling. I also have quite an extensive library of books from various Christian authors, but they don’t seem to address this particular problem. This is not years of physical or sexual abuse, this is not so much the bad things I’ve done (though there are plenty of bad things I’ve done) but that I don’t understand why God would put men in positions where abusing women was seen as funny and entertaining. And BTW telling me Pastors are just people too really doesn’t help, I think they should know better. I had to mind my P’s and Q’s all the years I worked at my job, got reprimanded if I slipped off those demanding pedestals, but nothing happened to this man, NOTHING. I realize this sounds small and petty compared to others pain…but there it is. I can’t let it go! This article touched me but not for the same reasons. My husband cheated on me for years, but I just couldn’t prove it. At one point, there was enough that I confronted him, and he somewhat agreed, but never actually admitted it and never has completely. This was about 8 years ago. We are still together, but I still struggle with severe anxiety with the issue, especially when he goes out of town for work. He stated at one point that he didn’t do that anymore, and I needed to let it go and get over it. But, it seems I can’t forget the past and “keep picking at the scab.” I said I forgave him, but I don’t believe I really did because it is an issue that has never completely been dealt with by either of us as a couple. It’s hard to forgive when I have uncertainty if he is still cheating and if he truly loves me. I want and need to let go of the past and forgive, but I just can’t figure out how? ?